Join us Tuesday, May 28 for your choice of one of four great pre-conference afternoon workshops or the all-day CFRE Refresher Course. Planned Giving — Planning to Give — Key Word, Planning! Anna Barber is President and Principal Consultant for Barber & Associates, a boutique fundraising consulting firm. Previously worked with the Smithsonian National Museum of African American History and Culture in Washington, D.C., as a Senior Individual Giving Officer. For over twenty years, Marcy Heim has created artful, authentic, and life-long major giving relationships at the University of Wisconsin. Simone P. Joyaux is a blogger, consultant, founder of two organizations, regularly serves on boards, and a former chair of CFRE International. Tim Kachuriak is founder and Chief Innovation and Optimization Officer for NextAfter, a research and consulting firm that works with businesses, nonprofits and NGOs to help them grow their resource capacity. Adrian Sargeant is Director of the Centre for Sustainable Philanthropy at the University of and Adjunct Professor of Philanthropy at the Lilly Family School of Philanthropy at Indiana University where he was the first Hartsook Chair in Fundraising. CEO of both Daryl Upsall Consulting International and Daryl Upsall & Associates, he has more than 35 years' experience of successfully founding and managing fundraising, communications and advocacy operations for over 230 nonprofit organizations in some 62 countries. He is known for his international leadership and innovation in fundraising and his role as an international ambassador for the fundraising profession. The Wednesday schedule includes inspiring presentations by all six speakers, breakfast and lunch, a massive marketplace of sponsors and exhibitors, networking with more than 600 fellow fundraisers, and an unforgettable experience in the Lone Star State! Sign up now to serve on the 2019 DFW Philanthropy in Action Conference Planning Committee. Please email Conference Chair or Conference Co-Chair to let them know on which of the following committees you would like to serve. You will be contacted with dates and times of planning meetings. Thank you for serving your AFP chapter and your profession as a member of the DFW Philanthropy in Action Conference Planning Committee. Click here to learn about becoming a 2019 sponsor. 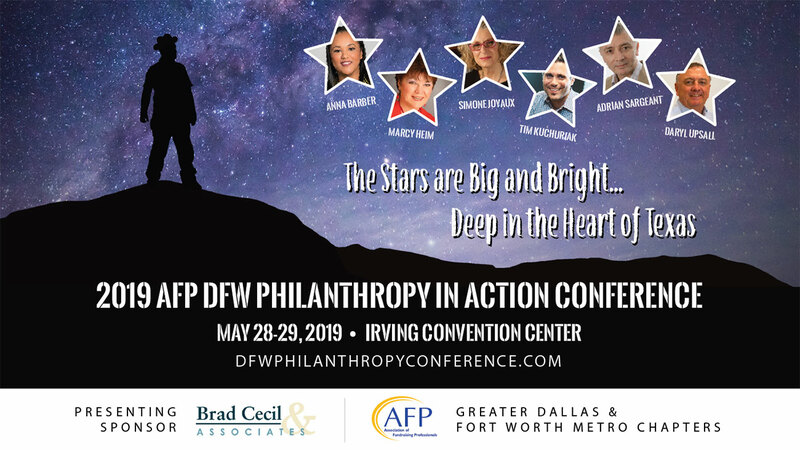 The Annual AFP DFW Philanthropy Conference and CFRE Refresher Course are brought to you by the Greater Dallas and Fort Worth Metro Chapters of the Association of Fundraising Professionals. If you're not already a member, consider joining now! We are pleased to announce that once again, The Omni Mandalay is the official hotel for the DFW Conference with a special room rate of $185 per night (plus taxes). Reservations can be made online or by calling 1-800-THE-OMNI and referring to the Association of Fundraising Professionals. Reserve early, the special conference rate will be in effect as long as the hotel still has availability. Tell others that you're part of the conference community by using #AFPDFW in your social media posts! Presented by the Greater Dallas and Fort Worth Metro Chapters of the Association of Fundraising Professionals.